Yesterday I attended a public policy forum hosted by The Consortium on Chicago School Research at the University of Chicago. The title was "Is Great Teaching Enough? The impact of school-community connections on the achievement gap." 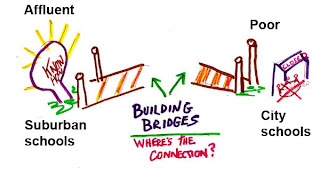 Within the information presented was a discussion of social capital, or the connections between people within a neighborhood (bonding capital) and that connect people in the neighborhood with others beyond (bridging social capital). I created the graphic above several months ago to illustrate how the Tutor/Mentor Connection is creating "bonding capital" by connecting people who are involved with inner city youth with each other and with a vast network of knowledge, with a goal that we create more volunteer-based tutor/mentor programs that connect kids in poverty with a network of adult resources outside of poverty. I have written about this many times in the past and often say that the connections we make between a youth and an adult, and a tutor/mentor program, are the most important values of having these programs. With so much emphasis on test scores in the funding community, it's great to hear researchers say that having this social capital may be the best strategy to help chronically poor schools, serving high concentrations of poor and African American students, succeed in school. I would add "and succeed in jobs and careers". So I went back to my computer and looked up some web sites which help me and others understand social capital, and the difference between bridging and bonding types of social capital. On one site, titled Social Capital: Bonds that Connect, the sub head was "Up against low income, poor education, few material assets, no insurance, and usurious credit, social networks may be the most important resource of the poor"
I agree. I hope that you'll spend some time browsing this article, and others that I've posted in the Links Library so that you can incorporate your understanding of these ideas into operations of a volunteer based tutor/mentor programs, or into the ways a company, foundation, faith group, college or hospital might support the growth of these programs in specific high poverty areas of big cities like Chicago. As you see the value of these ideas, hopefully you'll attend the May and November Tutor/Mentor Conference, and build your own network, while we expand ours because of your participation. The next conference is November 21 at the Chicago Field Museum. Over the past six months the Tutor/Mentor Connection has been creating a library of maps that are intended as tools that leaders use to support the growth of volunteer-based tutor/mentor programs in specific geographic areas. While I've written articles showing how these maps can be used, so has Mike Trakan, who creates these maps for the Tutor/Mentor Connection. Today Mike added a set of maps showing the 34th Illinois Legislative District, in the South part of Chicago along the border with Indiana. Two of these maps are shown here. The first map shows poverty demographics, locations of poorly performing schools and locations of tutoring and/or mentoring programs in the Tutor/Mentor Connection database. In this area we only see three listings. One is Link Unlimited, which is a high quality mentoring program. The other two listings are at Tuley Park and Smith Elementary. There may be other programs in the area, and these two may not still exist. Thus, the first way leaders might take a role, is to help us keep the data in the Tutor/Mentor Program Locator as current as possible. The bottom line is that youth in this district probably would benefit if there were more programs offering tutoring and/or mentoring in the areas with poor schools and/or high poverty. The second map shows the same indicators of need, however it also shows locations of branch banks of Chase, Bank of America, Charter One and CitiGroup. On another map we show Walgreens and CVS locations. These business locations could be meeting places for groups of people supporting tutor/mentor programs. They could even be places where volunteers and kids meet after 5pm on a week night. The program I led at the Montgomery Ward corporation started when a few employees started meeting with kids in the neighborhood, and operated from the cafeteria of Wards from 1970 to 1980. As you look at these maps, look at the expressways that go through the district. The headquarters of these banks are in the Loop. However, many of the people who work in these headquarters live in the South Suburbs, or even Indiana. Thousands of people past through this neighborhood every day who could be volunteers, leaders, advocates and donors. Someone just needs to help them think about taking this role. On the Mapping for Justice blog Mike also shows faith groups, hospitals and colleges in the district. All could provide leadership, meeting places, volunteers and help raise dollars to fund tutor/mentor programs in the district. While the elected leaders in the area could be mobilizing people to support a tutor/mentor connection strategy, so could the faith leaders, or business leaders. Kids in a high school service learning program could take this role. If leaders in different parts of Chicago, and other cities, begin to apply this strategy simultaneously, the result would be a roar of involvement, a greater flow of volunteers to more places, and a greater flow of operating dollars to support the involvement of these volunteers. That would begin to surround kids with more mentors and tutors and learning experiences, which over time would change the path many kids take as they move from elementary school toward careers. We can provide maps that show the growth in tutor/mentor programs in the area, and we can host events, like the November 21 Conference, which encourage people from different parts of Chicago, and other cities, to network and share ideas. However, it's up to the people who live, and do business, in this area to build and sustain tutor/mentor programs. 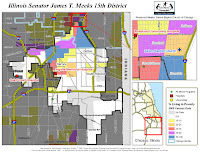 Would you like the T/MC to create a map analysis of your legislative district? 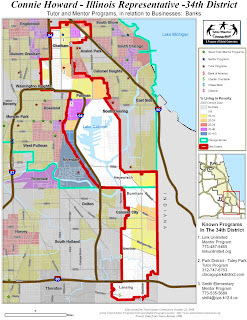 We can do any district that has part of its geography the city of Chicago. If you'd like to learn how to apply mapping concepts to other cities, or would want to help sponsor the T/MC map capacity, please contact the T/MC at 312-492-9614. 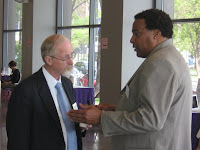 For 15 years the Tutor/Mentor Connection has been building a network connecting volunteer-based tutoring and/or mentoring programs in Chicago with each other, and with leaders in business, universities, media, faith groups, etc. who could help these programs grow throughout the city. When we say grow, we use charts that focus on jobs and careers as the long-term purpose of our efforts, even if the youth we are working with are only in elementary school now. We point to information on the T/MC web site that shows what other people are doing in other places, which are ideas programs in Chicago could use, if they have the resources to implement these ideas. One of the groups I've network with for many years is Technology For Humanity, who's mission is to "bring together resources from the public sector, private sector, faith-based and community-based organizations, to bridge the Digital Divide." A few weeks ago this group convened a meeting at Mt. Sinai Hospital, to discuss ways to get computers into the homes of thousands of inner city kids. As a result of that meeting I was asked to create a map, showing the neighborhood around the hospital, and showing a strategy that would not only distribute computers, but would build a support system so that the result might be more kids in this neighborhood coming to school ready to learn, and leaving school after 12th grade, with a network of adults, and a range of skills, that would enable them to move through college, or vocational education, into 21st century jobs. Such a support system would have structured, non-school volunteer-based tutor/mentor programs as places where kids could connect with donated technology, and with volunteers who would help kids use the computers for learning, career exploration, learning and more. If you look at this chart, imagine a tutor/mentor program as the hub of a wheel, and the spokes leading to the various kinds of learning and supports that might be offered to kids through that program. The volunteers at such a program serve as coaches, mentors, tutors, advisers, advocates and friends, helping kids connect with all of these resources, and helping the program get the dollars, technology and talent needed to facilitate this process. I've worked with Mt. Sinai Hospital in the past, and encouraged them to adopt the role of a Hospital Tutor/Mentor Connection, to support the growth of tutor/mentor programs in this area. Thus, I was pleased to be back in contact with this group. The map we created is shown below. Mt. 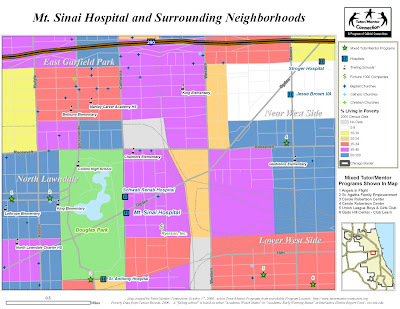 Sinai Hospital is near Douglas Park. The map covers an area that is about 3/4 mile to the West, 1 mile to the North, 1 mile to the East and 1/2 mile to the South. Part of this area is in North Lawndale and part is in Lower West Side. You can see from the color coding that the area has high levels of poverty in this area. It also has several poorly performing schools. Six organizations are shown on this map, who have indicated in the past that they offer some form of volunteer-based tutoring and/or mentoring. 1. Angels in Flight, a girls youth organization at 3315 W. Douglas. No web site. Here's how this map can be used. We found these programs by searching the Chicago Tutor/Mentor Program Locator. We did a search by community area, looking for programs in North Lawndale and Lower West Side. In North Lawndale we found 16 organizations who offer various forms of tutoring and/or mentoring, or youth development. In the Lower West Side, we found 7 other groups. We did not find any listing for a program at Mt. Sinai because the program that had operated their several years ago was discontinued, and the new one just came back on our radar last week. You can learn more about these six programs by going to their web sites, if they have one. When we meet with programs, we encourage them to look at how other programs showcase their work, using web sites and blogs. It's difficult for a donor, volunteer or parent to know you offer mentoring or tutoring if the information is hidden in a web site, or if you have no web site. Not every program has the resources to build a website, or even a blog. This is a role volunteers from the hospitals, colleges or businesses in the city could take. We can help set up a blog, like we did for the SON Foundation. It's possible that some of these programs no longer offer any youth services, or that other programs exist in the area, but are not on our database. Thus, one of the first roles of a Hospital Tutor/Mentor Connection would be to help the T/MC update its data, so that the information provided represents the most comprehensive, and up-to-date data. The first goal of the Tutor/Mentor Connection is to help programs already operating in an area get resources to constantly improve their impact. Thus, if you're reading this, you could contact one of these programs and offer your time, talent and/or dollars. If you're a communicator, or blogger, you could write about these programs every few months, to help them get a consistent flow of these resources. We don't know how well these programs compare with the best in the city. From the information on the web sites, we don't know if there is an arts, technology or career focus to the work being done. We don't know how many kids are served, or how long the programs keep kids and volunteers involved. Thus, if you're a reporter, or a researcher, you could compare these programs to other programs and write about the differences. You could even work with these programs to help them benchmark what they do against other programs, so they have help to constantly improve. However, we do believe there are too few programs in this area. There are several thousand K-12 kids in this area, and we don't see tutor/mentor programs near many of the poorly performing schools or in many of the areas around Mt. Sinai Hospital. More programs are needed, especially near the poorly performing schools. Who else could help? Our map also shows a variety of faith groups in the area. These could be places to host additional programs. They could also be places that build connections between suburban faith communities and the programs in this area. Our map shows the Eisenhower Expressway, on the North part of this area, and Ogden Avenue, as a diagonal route connecting downtown Chicago with the Southwest suburbs. The Stevenson Expressway is just to the South (You can drag the Google map up or down on the Program Locator to see other parts of the city.) This is important, because these highway routes bring potential volunteers and donors through this neighborhood every day. A tutor/mentor marketing and communications strategy should be aimed at reaching a growing number of these people so they become leaders, volunteers and donors to support the programs growing in the area. If faith groups at the West end of the Eisenhower encourage members to be volunteers, donors, partners with inner city programs, they could point people to this neighborhood, and the local churches could facilitate this connection. The map shows that St. Anthony Hospital and Schwab Rehab Hospital area also in the area, along with Stroger Hospital and the Jesse Brown VA Hospital. The University of Illinois Hospital and Rush St.Lukes is just to the East. In addition, Ryerson, Inc. a Fortune 500/1000 company is close to Mt. Sinai. You can determine what additional, smaller businesses might be in the area by using the Google Map on the Tutor/Mentor Program Locator. When you do a search the programs in the area will be plotted on a Google Map. You can click the icons on the map and learn the name, address and web site (if any) of each organization. You can also go deeper to find contact information for other businesses, restaurants, churches and organizations in the area. Thus, there are many places where programs could operate, and many organizations who could be helping those programs get volunteers and dollars to sustain these programs as they grow from good to great. There are even places that could offer job shadowing and vocational training as kids go through high school, and college. What's needed is leadership to mobilize resources to support the existing programs, then to help fill the area with additional programs where there are voids. The essay titled role of leaders shows a role that the major hospitals, or Ryerson could take, since they are the largest employers in the area. Since Mt. Sinai operates its own tutor/mentor program, it would be ideal for this leadership could come from the presidents of the hospital. Even the Congressman representing the 7th District could take this role, since this area is part of that district. I think the hospital leaders should take this role. These public health articles, and the information in this Tennessee Health Authority Web site show that hospitals have a self interest to help youth in their neighborhoods stay in school, and prepare for careers in health professions. One article profiles a mentoring program led by Vanderbilt University Medical Center which could be a model for programs operating around hospitals in this part of Chicago. Ryerson, Inc. could also provide leadership to a neighborhood strategy, encouraging employees and customers to be volunteers, and setting up workplace fund raising campaigns to help raise money for the tutor/mentor programs in the area. 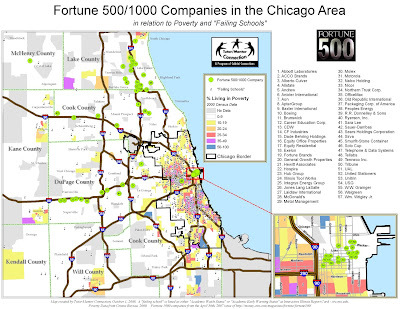 They are one of the few Fortune 500/1000 companies still in Chicago neighborhoods. There are lots of ways to innovate support strategies for tutor/mentor programs in this area. The computers that are being offered could be used to help people find and read this blog, and use the information on the T/MC web site, to connect with each other, and collaborate on program development strategies that help kids and volunteers stay connected, help the computers be updated on a regular basis, and help kids learn to use technology to manage knowledge and solve problems. If the leaders in this area appoint "take charge" people, and use their facilities as meeting places, and advertising as mobilization resources, they can draw attention to tutor/mentor programs on a regular basis, using the T/MC schedule of events shown below. If the faith groups in this area join in, using their own communications to mobilize volunteers and resources for the tutor/mentor programs, they can encourage faith groups in the suburbs to do the same, mobilizing volunteers who travel Ogden Avenue, or the Eisenhower, to be supporters of tutor/mentor programs in the neighborhoods they drive through every day. If enough private sector leaders take this role, the media, and the politicians, will follow. I can't make this happen. Only the people in the neighborhood can do that. However, I can update this map every year to show if more tutor/mentor programs are in the area. I can also put flags on business, hospital and church sites, indicating which are providing leadership support for this effort. Hopefully these maps will show that leaders have embraced these ideas and the kids in this area are getting more and more help to support their journey from first grade to jobs and careers. When this article was written, the Tutor/Mentor Connection (T/MC) was part of a non profit organization. In 2011 the T/MC became part of Tutor/Mentor Institute, LLC. If you'd like to help develop and update this mapping analysis system, email 'tutormentor2@earthlink.net' to discuss sponsor, investor and/or partner opportunities. I'd like to point to three links on the Tutor/Mentor Connection web site that I think would be valuable resources for anyone working to help kids move from poverty neighborhoods to 21st century jobs and careers. In their overview they write, "This website holds a wealth of findings about what it takes to improve the lives of children and families living in America's tough neighborhoods. Community coalitions, providers of services and supports, funders, and policymakers will find a broad collection of information about what works in social programs and policies to achieve desired results, including increased rates of children ready for school and higher numbers of economically successful families." This site provides tools that non profits and community organizations can use. This particular link goes to a page focused on gathering information and evaluating progress. This is an event we host in Chicago every six months to draw people together to network and learn from each other. The people who attend these conferences, and visit our web sites would probably find a lot of value from the Pathways Mapping Initiative and the Community Tool Box, if they knew they existed and had the manpower in their own organizations to put these ideas to work. One of the goals of the conference is to attract donors who might fund the work of the conference participants, so the do have the resources they need to apply these ideas. This is the documentation system T/MC created in 2000, borrowing from ideas being created at the University of Kansas. Click into the discussion pages to ask questions and share your own ideas about how such a system is intended to be used. I have been doing a Google Search for bloggers who talked about using maps in the messages posted over the past couple of days. I've found several and introduced myself through comments. My aim is to connect these bloggers so that the maps we create are better and seen by more people, because others are also beginning to duplicate what we're doing to support youth organizations in their own city. If you're mapping poverty, and trying to draw resources to tutor/mentor programs, why not introduce yourself and let's work together. I just signed on to today's Blog Action Day event. Hundreds of bloggers from around the world will be writing about poverty and looking at what each other is writing. For those of you who get here, please look at the tags to the left showing topics such as maps, poverty, violence, complex problems, etc. I've been writing about poverty, and using maps to point resource providers to places where they can work to end poverty, for the past 15 years, using this blog for the past few years. I hope you'll adopt some of these ideas in your own writing, so that you'll blog about poverty and point to a map, or on-line database, at least once a week, so the weight of our collective efforts can begin to attract political and business and faith leaders, who will lead actions that support a distribution of needed resources (volunteers, ideas, technology, dollars, etc.) into all of the parts of the world where poverty is an everyday fact of life. 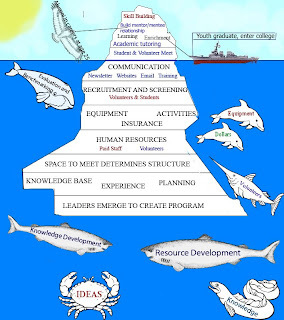 I saw a blog article that used the illustration of an iceberg to show that there's a lot more to marketing than what you see. When someone visits a tutor/mentor program and seeks a youth and volunteer meeting, they immediately start asking about test results and impact outcomes. I'd like them to take a look at what it takes just to get this youth and volunteer connected, and to keep them connected as the youth moves toward high school graduation. I scratched out a graphic of what made a good tutor/mentor program possible, and asked Chris Warren, our Public Interest Fellow from Northwestern University, to see if he could clean this up for me. The image on this page is his rendition. 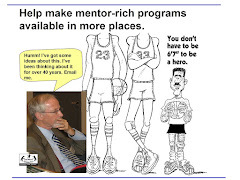 On the Tutor/Mentor Connection web site you can read the article I wrote explaining what it takes to make this connection. We've made the commitment to put our time and talent into making this happen. Can you make a commitment to providing the operating dollars to help one of more of the different tutor/mentor programs in Chicago? Visit this list to learn more about different programs in the region. "Market woes should pale next to local carnage"
Dawn, thanks for letting your anger show, but I wish media people would try to find a way to write about this every day, not just when they decide to. I've been writing about this since 1992 when Dantrell Davis was killed in Cabrini Green. When I write about it I point to ways people can become tutors/mentors in non-school programs operating in some of these neighborhoods. You can read one of my articles at here. I believe in volunteer-based tutor/mentor programs not because they are a magic solution, but because the connect people who don't live in poverty with kids who do. As a volunteer meets with a kids each week, often for several years, it's hard not to become angry, or to become personally involved. Until we get more people beyond poverty personally involved, not much will change. Finally, I use maps to help people understand where poverty and poor schools are located, and where tutor/mentor programs operate, or are needed. In these maps I create overlays showing churches, hospitals, universities, and business operating in these neighborhoods, who would benefit if the poverty and violence were reduced. These are the groups who need to be strategically involved. I can create all of this, but if no one looks at it, I'm a crowd of one. It's up to you in the media to connect your stories to information that people can use to learn more about the problem and to get involved in the solutions. If you do this once a week for the next ten years, maybe others will follow your example and they will help us put more programs in these areas to help parents, and compete with gangs, for the attention of kids. It's also up to faith leaders, businesses and others to use their own communications to connect people who want to solve these problems with places where they can learn, and where they get involved. It does take a village. But the village needs a plan, a map, and needs to stay involved for many years if we're to change what took many years to create. Skills improvement, staying in school, long term connection with students and volunteer were the most important goals, but none of these was rated most important by more than 33%. No one rated college enrollment, starting jobs or careers or staying connected to programs at later ages as most important. In fact, staying connected to the program was least important to 63% of programs. College and career were least important to more than 40% of respondents. Although staying in school through high school graduation was most important to 68%. What happens after that? How do we attract business support if our goals don’t lead kids to jobs? I think this shows that we had a small sample and many different kinds of programs represented. However, this illustrates an understanding that I've built over many years. The "tutoring/mentoring" world is very diverse. I think that building an understanding, or grouping of different kinds of programs, would have a lot of value, and could help programs focused on similar goals work together to find the resources to achieve those goals. What do you think? I hope you'll visit the survey page and add your discussion. If you've experience doing surveys, and making sense of the information, we'd love to have you volunteer your time and talent to work with us. Illinois State Senator, the Rev. James Meeks has been leading a publicity campaign intended to draw more state money to fund public schools. Most recently was a boycott on the first day of the 2008-09 school year, and a picket line outside the Cubs game at the first round major league baseball playoffs. This is great publicity. But as I've written many times before, just doing a march does not draw volunteers and donors to places in a neighborhood where kids can get help needed to stay safe in non-school hours and be better prepared for school. We've been creating maps to show how leaders in government, faith groups, hospitals and universities could mobilize resources to support the growth of volunteer-based tutor/mentor programs. 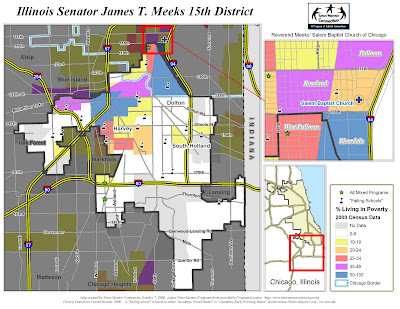 Today, the Mapping For Justice blog has a series of maps, like this one, showing the Illinois Senate district of Rev. James Meeks, along with the neighborhood around Salem Baptist Church. These maps are intended to serve as tools for leaders like the Rev. Meeks. While it may take years to build the public and political will-power to put more money in schools, it only takes the commitment of a few people to launch a tutor/mentor program in neighborhood. In this area there are two groups trying to start programs. We helped the SON Foundation start a blog last week. Kids Off the Block has been struggling to find resources to expand for a long time. 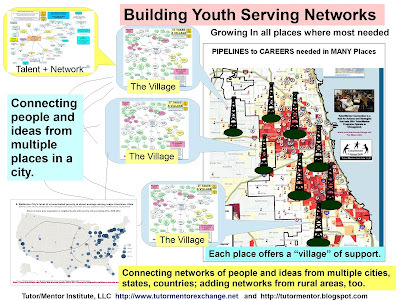 You can search the Chicago Program Links to find information for other groups working with youth in this area. Our goal is that leaders point to these programs when they are giving sermons, or press interviews, or doing advertising, so that people who listen to their messages are encouraged to volunteer time, talent or dollars helping existing programs grow in the mapped area, or learning ways to create new programs in places where none now exist. In addition, our goal is that faith leaders like the Rev. Meeks, encourage learning circles to form within the congregation, so that people are discussing the research and maps found on the Tutor/Mentor Connection web site, and in the links on this blog, so that they grow more and more sophisticated in understanding poverty and poor schools as a complex problem that does not get solved by just making more money involved, but by getting more people from business and community and colleges involved. Faith leaders have been pointing congregations to scripture for thousands of years, and coaching the understanding and actions of people on a daily, weekly and monthly basis. If they form groups focused on helping kids move safely from poverty to citizenship and adult careers, the actions of congregations can actually increase the number of people who are involved, and who vote to support policy changes to support their involvement. The Tutor/Mentor Connection would be happy to meet with your group to help you understand how to use these maps, and to coach you on building support for tutor/mentor programs. We'll host a conference on November 21 at The Chicago Field Museum. We hope you'll attend, and begin this learning process. As you meet in your own congregations this weekend, or gather with friends and family for sports or other activities, I hope you'll think about ways you can support the growth of such learning circles, in the Chicago region, or in any other part of the country. What sacrifice will our next President ask from Americans? As I listened to the debate last night I felt that both candidates did a good job of not answering the questions they were asked to answer. I was disappointed. But that's probably good campaigning. If you give too specific an answer, you risk giving someone a reason not to vote for you. But the question of "sacrifice" seemed like a real opportunity for leadership. Someone talked about the level of sacrifice our men and women in the armed forces give, and asked what level of sacrifice would the next President be willing to ask of citizens. I ask this question because this is the heart of the type of inspirational leadership this country needs, now, and for the next generation. What are men and women, corporations, faith groups and others in places beyond the high poverty areas of Chicago and other big cities willing to do to assure that all kids born this year in a high poverty neighborhood are starting a 21st century job and career by 2033? Without the help of extra adults beyond the high poverty neighborhoods inner-city kids are born in, it's not likely that most of the kids in these neighborhoods will realize their potential. That will be a loss for our society, and a drain on our economy. I don't think the solution lies in more government spending. It lies in more personal involvement. I encourage you to read the articles Cassina has written and the student and volunteer profiles that Chris has written about Cabrini Connections. What type of commitment will it take from our volunteers, and our donors, to help kids at Cabrini Connections, and in hundreds of other tutor/mentor programs, move through school and into careers? What type of day-to-day leadership can we expect from the next President, and the one after that, and the one after that to sustain these types of connections with kids, families and communities for the next 20 years or more? We host a Tutor/Mentor Leadership and Networking Conference in Chicago every six months to help programs and other tutor/mentor supporters connect and learn from each other. The next conference will be November 21 at The Chicago Field Museum. I hope you'll plan to attend, or give your support. "Ask not what your country can do for you, but what you can do for your country", would be a great strategy, if a map were used to point to the places where help is needed, not just for one or two days, or even a year, but for many years. I've watched the first two debates and I think back to the 1992 election when Ross Perot was holding up charts to illustrate his ideas. I wish one of our 2008 candidates would hold up maps like the one shown on this page, to demonstrate their vision for solving some of the problems they will face in the next four years. This map shows poverty concentrations as well as locations of poorly performing schools in the Chicago region. In addition, it shows a list of Fortune 500/1000 companies. Notice that many companies are located in the Chicago Loop area, and many are located in the Lake County area (North suburbs) or the DuPage County area (West Suburbs) but none are located in the South Suburbs (that may change if the new airport gets built). Thousands of people coming and going to and from work in these companies pass through high poverty neighborhoods of Chicago and the inner ring of suburbs everyday. Leadership from elected officials, faith leaders, corporate CEOs and even kids in high school service learning programs, could show many of these people ways to stop for a couple of hours on their way home, to be a volunteer or leader at a neighborhood tutor/mentor program working to help kids in these neighborhoods come to school each day better prepared to learn. The same leadership could encourage people to make donations to programs they pass each day. It can also draw together teams of people, as we will do at the November 21 Tutor/Mentor Leadership and Networking Conference, to learn ways to be involved, and ways to help tutor/mentor programs be available to kids around every poorly performing school in the city and suburbs. This next conference will be hosted by the Chicago Field Museum, 1400 S. Lake Shore Drive, and will include discussions aimed at connecting Chicago museums and cultural institutions with tutor/mentor programs and at-risk kids. During the June 2008 National Conference on Volunteering and Service, I attended several workshops providing information on business volunteering, with research provided by companies like Deloitte and Accenture, showing the benefits to business and employees from such involvement. I posted links to some of that research here, and encourage companies shown on this map to use this as a starting point for beefing up their own involvement. Many companies already have extensive volunteer and philanthropic involvement. My hope is that they will begin to use maps, like these, to plot where they are involved, creating layers of information for each focus area (health, education, workforce development, etc.) so they can better understand the distribution of their involvement, and look for ways to use their resources strategically so they have a growing impact on corporate and community goals. This is a map of Lutheran Churches. To learn if there are any tutoring and/or mentoring programs in the area of specific churches, use this zip code map. 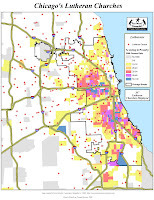 If you're the Mayor of Chicago, this map shows that you need to find ways to create a regional business support strategy to help draw more volunteers to schools and tutor/mentor programs in the city. If you're in Waukegan, Elgin, Aurora or Joliet, you need to find ways to draw volunteers and donors to programs that help youth in your own communities. And if you're one of those scattered schools on this map that seem isolated from all others, your students can help you call for help from local and regional companies, so tutor/mentor programs and other learning activities are available to help your students, too.